TenX is a cryptocurrency company that aims to develop a cryptocurrency Visa debit card. The card would allow users to directly spend their cryptocurrencies anywhere Visa debit cards are accepted. Given the ubiquity of Visa's network, if TenX achieved its goal, it'd quite literally make cryptocurrencies spendable everywhere. Of course, in the crypto-world, reality often diverges significantly from the sales pitch. This is the story of an ill-fated cryptocurrency company and its charismatic yet suspicious co-founder and president, Julian Hosp. 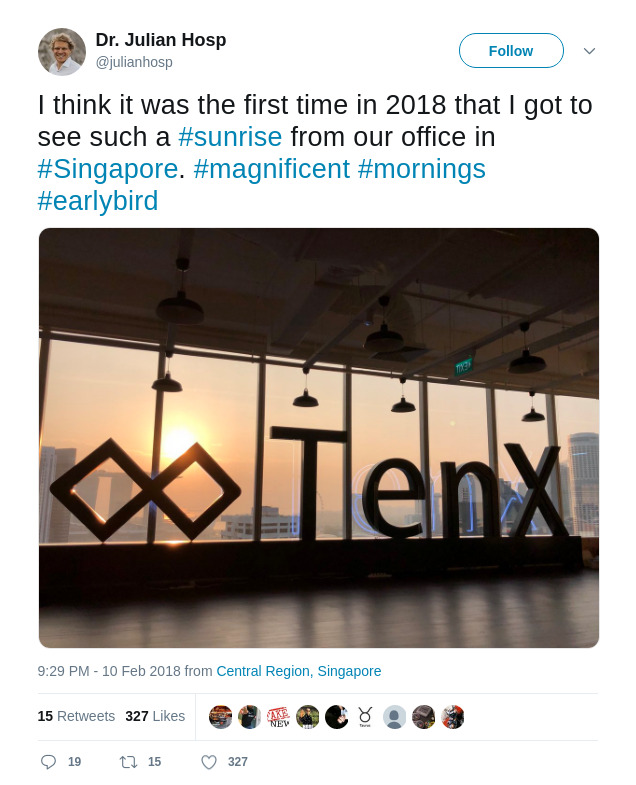 TenX is a Singapore-based company founded in 2015. In 2016, they received their first outside investment and also incubated with PayPal. In 2017, TenX launched its ICO in the onset of 2017's crazy cryptocurrency bull market and it became one of the biggest and most rapidly funded ICOs ever. The funding cap of 200,000 ETH was reached in 7 minutes as 4,000 users rushed to invest. With ETH being worth $330 at the time, the 200,000 ETH raised was equivalent to almost $70 million. TenX's promise is to develop a cryptocurrency Visa debit card which allows users to spend their cryptocurrencies anywhere that accepts Visa debit cards. The backbone of this system consists of the COMIT Network and the PAY token (hosted on Ethereum). Put simply, COMIT is a real-time exchange system used to exchange between cryptocurrencies and fiat currencies. COMIT enables TenX to plug cryptocurrencies into Visa's traditional debit card network. The PAY token is, cynically, a vehicle that enabled TenX to raise funds through an ICO. Officially, the token is part of an incentive system where token holders will receive a portion of all transaction fees derived from TenX debit card payments. It's interesting to note that TenX had originally advertised Vitalik Buterin, the inventor of Ethereum, as an investor in their website and whitepaper. However, Buterin had not invested and TenX had to pull his name from their investor list after Buterin found out. Buterin is a famous and highly respected cryptocurrency figure since he invented Ethereum and attaching his name to any project lends a lot of credibility. In this case, TenX had clearly lied about Buterin's involvement with TenX to market their ICO. When the team was asked why they misleadingly used Buterin's name, they claimed that since Fenbushi Capital is an investor in TenX, and Buterin is a Partner at Fenbushi Capital, they could use his name. However, anyone with a basic knowledge of how venture capital firms work knows this is not the case. The president of TenX was a charismatic and articulate Austrian named Julian Hosp. If you can believe his LinkedIn profile, he has an impressive background being an ex-professional kitesurfer and medical doctor. 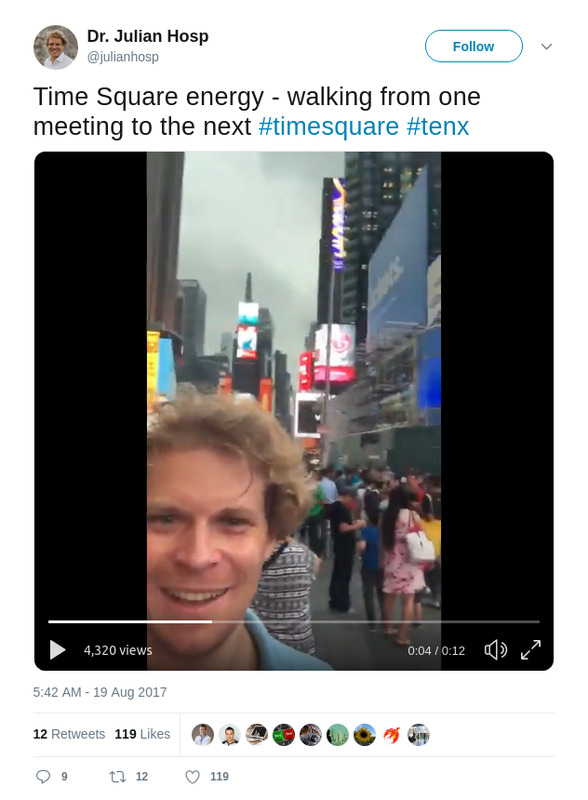 While working as TenX's president, Hosp cultivated his public personality by maintaining an active social media presence through YouTube and Twitter, authoring a cryptocurrency book, giving a plethora of speeches at various cryptocurrency conferences, and even appearing on major news networks like CNBC and Channel NewsAsia a few times. His strong public presence turned him into the informal face of TenX. At one point, the majority of TenX's communications with its community went through Hosp. Hosp appeared in most of TenX's YouTube videos. He hosted weekly update livestreams and created a large corpus of explanatory videos on TenX and other cryptocurrency topics. Hosp's active tweeting gave the community a candid look into the inner workings of TenX and Hosp's day-to-day duties. Things went swimmingly for TenX in the few months after the ICO. The massive influx of funding, coupled with a rapid appreciation of the funds from the cryptocurrency bull market, allowed the company to move into a sweet new office and aggressively hire. The company grew from around 20 employees in September 2017 to more than 80 employees a year later. The PAY token, which traded at around $0.50 USD after the ICO, skyrocketed to more than $5 in August. This meant that PAY had more than $500 million in market cap. Although there was a brief drop to around $1.5 in October and November, PAY's price soared back up to $5 in December. TenX was also given a lot of media attention. In 2017, Hosp appeared on major news networks 5 times, once with Bloomberg, three times with CNBC, and once with BBC. Hosp also spoke at the European Internet Forum, an event with close ties to the European Parliament. TenX was issuing cryptocurrency debit cards early on. The first TenX cards were made available in Singapore in June 2016. By the time of the ICO in June 2017, TenX had started issuing cards in Europe as well. Due to the attention the company received from its explosive ICO, demand for the cards soared and many users were put on a wait list. The first bad news happened in September 2017. TenX announced that their Visa card issuer, WaveCrest Holdings Limited, could no longer issue and maintain cards outside of the European Union. Despite tactlessly declaring that all non-EU TenX cards have just become "cool souvenirs", the company promised that they're working on a solution. They were trying to acquire a banking license, which allows them to issue their own cards, and they were also trying to onboard alternative card issuers. The next piece of bad news surfaced in December 2017. Despite firmly promising that there's no chance the PAY token can be a classified as a security in an October blog post, it was announced in December that the token will be "restructured" to minimize this risk. Because many jurisdictions, such as the US and the EU, have stringent securities regulations, a cryptocurrency is essentially dead if it was classified as a security. Hypothetically, the most immediate effect of such a classification is a delisting from most cryptocurrency exchanges. As part of the restructuring, PAY token holders will no longer receive a portion of all transaction fees from TenX's payment network. This change was significant and bad; the transaction fee reward was the primary reason to invest and own PAY tokens. TenX's ICO sales pitch was that, in a couple years if all goes as planned, it would be lucrative to own PAY tokens when TenX processed billions of dollars in payment volume. This was temporarily not possible and the original reason to invest was voided. It was clear that the restructuring announcement was made hastily, probably from pressure from cryptocurrency exchanges that didn't want to list securities, since the restructuring announcement didn't offer a view into what the new PAY token will be useful for. Instead, the company promised that they were doing their "best to complete the update of the PAY token structure... with [their] legal advisors" and the they were confident that their users "will love the updated structure". The PAY token was eventually turned into a "utility token" that can be used to pay transaction fees on TenX's payment network. A new token called TENX, which is also hosted on Ethereum, will be issued to all PAY token holders, with 1 TENX token created for every PAY token. The TENX token is essentially what the old PAY token was; TENX token holders can receive a reward proportional to the payment volume on TenX's payment network. 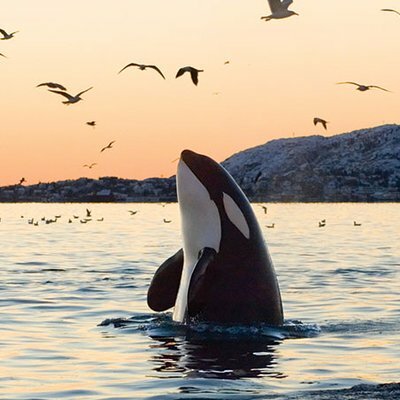 However, these rewards were not available to residents and citizens of various countries, including the United States, and all possible reward recipients needed to go through a Know Your Customer process with TenX. The biggest blow to TenX happened in January 2018 when Visa abruptly ended its relationship with WaveCrest, TenX's card issuer partner. All WaveCrest-issued cards, including the TenX cards, were immediately disabled. Visa claimed that they ended the relationship not because of WaveCrest's close association with cryptocurrencies, but because of a compliance issue. This was devastating for TenX and its community. The company suddenly found itself with no product, a throng of disappointed customers, and no clear timeline to start issuing cards again. When Visa ended its relationship with WaveCrest in January 2018, PAY's market cap was just under $500 million. Over the next year, TenX could not find a way to issue new cards and, with the cryptocurrency bear market, PAY's market cap crashed to around $30 million by year end. Along the way, there was a lot of card issuance teasing and sometimes false promises made. 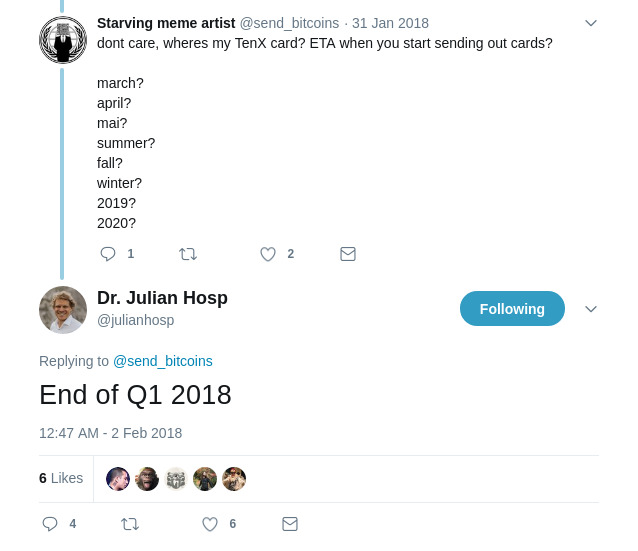 For example, in this tweet, Hosp claimed that new cards would be available by the end of Q1 2018. Hosp continued to maintain an active social media presence, releasing video after video on YouTube and tweeting incessantly. He was still the face of TenX. Then, in a surprising turn of events, Hosp published a YouTube video on January 8th, 2019 titled "I am stepping down as TenX president". This came as a surprise to the community and many were angry and felt betrayed. Hosp had lived and breathed TenX and he had spent the past two years promoting the company. For him to suddenly leave suggested something was seriously wrong with the company. As the dust settled, however, a couple disturbing details about Hosp were surfaced. First, a prior accusation that he was involved with Lyoness, a discount shopping service declared as a pyramid scheme in Norway, Austria, and Switzerland, before co-founding TenX, was resurfaced. This is a rebuttal of the accusation and I'll let the reader be the judge. Second, a new accusation was made that Hosp sold the majority of his PAY tokens in two weeks spanning December 2018 and January 2019, significantly pushing its price down. The accuser shared two Ethereum addresses that were likely Hosp's and a series of large deposits of PAY tokens to Bittrex (the only Western cryptocurrency exchange listing PAY), exceeding 2,000,000 PAY, from the two addresses. There was also a suspicious spike in PAY token sell volume on Bittrex on December 30th. Even though Hosp is legally able to sell his tokens, selling the majority of his PAY token holdings in such a short time period is still viewed as a sign of no-confidence in his old company and a betrayal of a community he was so close with. Although Hosp played a prominent role as the face of TenX, he didn't appear to play an important operational role as an executive. TenX had two other co-founders, Toby Hoenisch (CEO) and Paul Kittiwongsunthorn (CDO, Chief Digital Officer). Both were rarely in the limelight and one can assume they were more involved in running the company. The loss of Hosp is a loss in public relations but the company is still in good hands. Given the huge warchest raised in the ICO, TenX probably still has a comfortable run rate and can sustain their 80+ employees for a few more years. The company recently launched the TENX token and appears to have secured a new card issuer. They are slowly rolling out new cards, focusing on the APAC (Asia-Pacific) first, with Europe next, and finally the rest of the world. As for PAY's market cap, Bitcoin's recent anemic performance coupled with the departure of Hosp has pushed it down to $18 million with a measly $340,000 in 24 hour trading volume. This is a stunning 96.4% decline from its peak in 2017 when its market cap was just over $500 million. It's an unfortunate fall from fleeting glory, can the company pull itself back up?